A few months ago, I got a call from a close friend of ours. He was at the hospital with their 8 year old son who had just broken his leg. X-rays had revealed something unexpected: cancer. I won't go into the details, but as you can imagine, these recent weeks have been both heart-wrenching and grueling. Hospital stays for energetic 8 year old boys are trying under the best of circumstances, but weeks' long chemo treatments are No Fun. So you can imagine what a treat it is to see a friendly, furry face walk through the door for a special visit. We haven't met a therapy dog (neither has mom) but we certainly applaud those that go the extra distance to get the training and bring their animals (yep - there are therapy cats too) to those people that need a break and a fuzzy face. :) And we hope your friend and his son are doing ok too. Thank you! The treatments are working and he's now in physical therapy (also no fun - but progress! YAY!). I read in a news article about a boy who had a bucket list for his dog. The name of the dog was Bingo. He was a guide dog who save this boy 3 times in 6 months because the boy had a bad kind of apnea. Bingo was discovered to have Canine Cognitive Dysfunction Syndrome. Therapy dogs and their owners.......3 cheers and a well deserved round of applause. Have a terrific Thursday. SERIOUSLIES? Oh that's pawesome that you guys did that! You brought moments of sunlight into their lives, we know you did! My heart goes out to your friend and his family. It is wonderful that people take time to work with and train dogs (and cats) to do this sort of thing. I know full well that if I ever end up in a facility that doesn't allow pets I so want to be a part of such a program..
We agree! And thanks so much for your kind words. They're very special - almost family to us - and it's just hard to watch a sweet young boy go through this and know there's not much you can do to help. Faraday's too skittish to ever be a therapy cat, but Allie & Maxwell were just invaded by two 3 1/2 year old girls when we used our home yesterday for a shoot...and those two held up pretty well. They even "crashed" the shoot and posed for the camera. AND let the girls pet them, too! Thanks so much, Kjelle! We agree, can't you just imagine the faces lighting up? Truly a welcome sight! Big (((purrs))) to this brave boy and his family. We can't imagine how hard this all is. Hearing stories like this reminds us what an important role therapy animals play. We are honored to know two great therapy animals. Snoopy from Snoopy's Dog Blog and Spaghetti Bob Registered Therapy Kitten. Bless all the therapy animals and their generous humans. Thanks so much for your purrs, Katie! Yes, isn't it wonderful what Snoopy & Spaghetti Bob and their humans do? 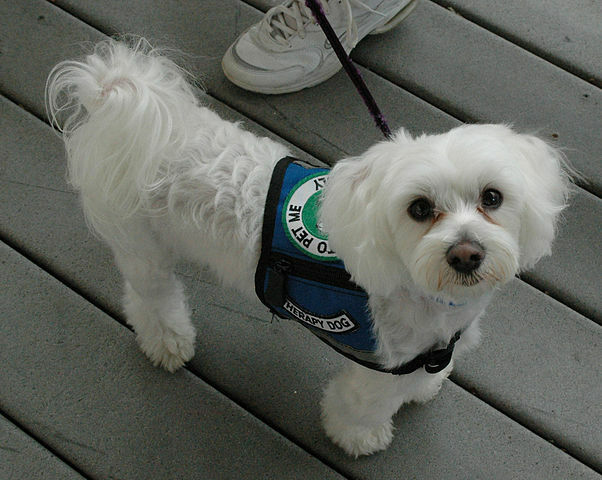 I know several therapy dogs from social media, including our own MattieDog. We applaud them also. Sorry to hear about your friend's son. Healing purrz. I also know a couple of therapy cats who blog! My human has always wanted a cat who could do therapy work because she is not really a dog person and would REALLY miss kitty energy if she had to be in the hospital - and she knows others must feel the same way. So far, nokitty she has lived with has had the temperament. Although Binga has come closest. I look forward to the day therapy dogs (or cats or rabbits or....) are allowed into hospitals. I know if I were to be in the hospital (or a retirement home), I would love to have visit from a friendly furry. What a difficult time for this boy and his family. Having worked in a hospital I can attest that these therapy dogs make a huge difference. I couldn't agree more! Our buddy Snoopy of Snoopy's Dog Blog does therapy work. We used to bring Dakota to the nursing home when my father-in-law was alive. He was in the Altzheimer's Unit. Dakota isn't a service dog per se but they allowed him to visit because he is calm (in public lol) The residents used to light up the second they saw him! Oh my word. How heart wrenching for any parent. I hope all goes well for the family. Therapy dogs are wonderful!! We send purrs to your friend's son and his family. Aw, I bet that furry little face cheers up efurryone he visits! Many purrs and purrayers for your friend's son! What a wonderful thing these woofies and their humans do for those who need it most. I have first-hand experience with the joys of therapy dogs visiting in a hospital. The one and only highlight of my experience over 3 months of daily treatments in an Infusion Center was when the volunteers brought their darling dogs in to keep us company! I wasn't the only one who shed a tear when we' got a nuzzle and a kiss from a sweet dog who really seemed to KNOW we needed it....special people and special dogs for sure. I do hope your friend's son does well. I know it's a scary time for them.